Italian dough work it going most popular in this era to make jewellery, decorative items etc. It doesn’t matter you a beginner or expert, working with it is much easier. Italian dough is mouldable and so soft; however it’s much easy to work with it. Today, I’m going to share you a tutorial of DIY beautiful earrings using air-drying Italian dough/Cold porcelain clay. You can make it easily at home, it doesn’t require any heating. It’s an inexpensive way to follow latest fashion or to create new fashionable jewellery. Don’t use it to make crockery as it will get dissolved with water or heat. First or all mix all the ingredients except corn flour. After that add corn starch/corn flour gradually and continue stirring. Now knead it well using your hands. If it gets sticky you can grease your hands using petroleum jelly. Now heat the mixture in microwave for 12-15 seconds. You have to repeat this procedure thrice and in between these intervals take it out and mix well. I used 1100W microwave you can change the timing according to the power of your microwave. Knead it continually till it’s no more sticky to your hands. You will observe that top have turned into a matte finish. You will observe lumpy appearance, start kneading again till it gets cooled down and proper shape. Dough is done. Don’t overcooked it. You can save this dough for future use in a plastic bag but before storing grease the bag using Petroleum Jelly properly. And can use according to your need. Keep this dough overnight and start working the very next day. 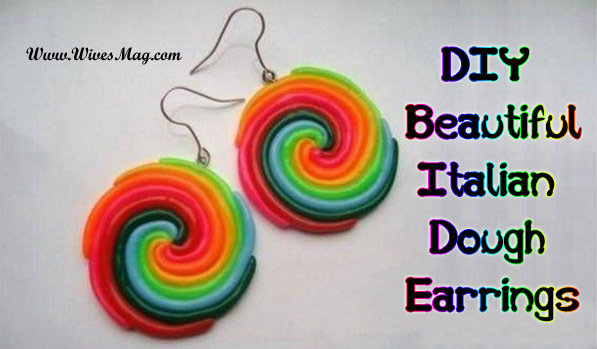 To make DIY Beautiful Earrings, take dough what you have stored in plastic bag. Now you need to add colors in this dough. Divide the dough into little parts. Start to add colors, knead it properly to mix color well, and make small balls. Now take each colored ball and roll it to make an elongated shape like stick. Now join the one tip of each one to make a center. Bend it the way I have shown in images. Here’re the pictures to guide you. Follow the instructions. Here the end result. DIY beautiful earrings, you can wear on every event.